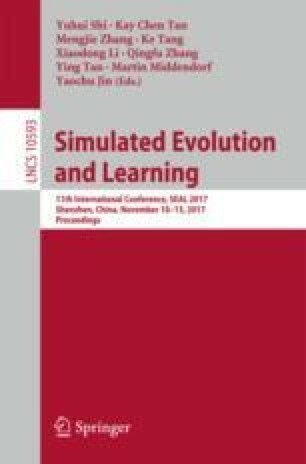 Interactive evolutionary computation assisted with surrogate models derived from the user’s interactions is a feasible method for solving personalized search problems. However, in the initial stage, the estimation of the surrogates is very rough due to fewer interactions, which will mislead the search. Social group intelligence can be of great benefit to solve this problem. Besides, the evaluation uncertainty must be carefully treated. Motivated by this, we here propose an interactive genetic algorithm assisted with possibilistic conditional preference models by articulating group intelligence and the preference uncertainty. The valuable social group is determined according to the given keywords and historical searching of the current user. We respectively construct the possibilistic conditional preference models for the social group and the current user to approximate the corresponding uncertain preferences. We further enhance the current user’s preference model by integrating the social one. Thus, the accuracy of the user’s preference model is greatly improved, and the fitness estimation from the preference model is more reliable. The proposed algorithm is applied to the personalized search for books and the advantage in exploration is experimentally demonstrated. This work is supported by the National Natural Science Foundation of China with granted number 61473298.